Common shelduck Tadorna tadorna, photographed by Paolo Sacchi. 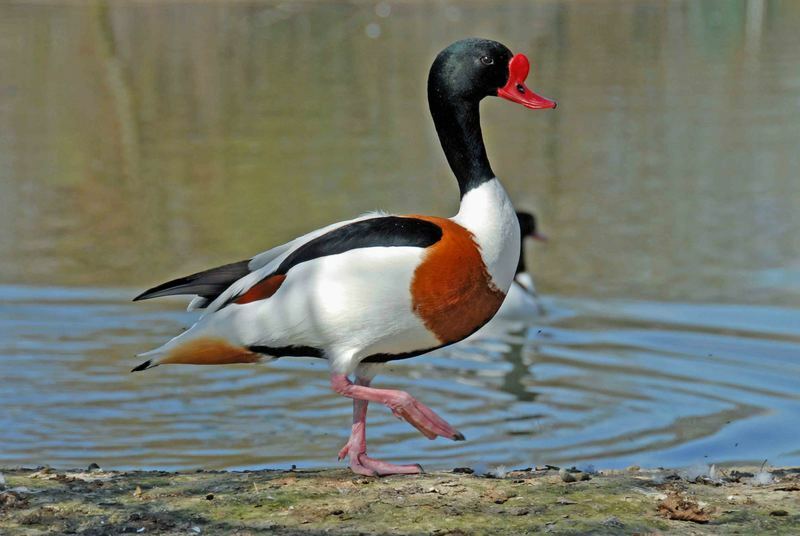 The Tadornini contains the shelducks and sheldgeese, an assemblage of moderately large waterfowl with short thick bills and generally rather bold coloration. The composition of this taxon has varied somewhat between authors; that given below represents a fairly restricted concept of Tadornini. Of the component genera, species of Chloephaga, Neochen and Alopochen are more 'goose-like' in appearance, while Tadorna species are more 'duck-like'. The sheldgeese of the genera Chloephaga and Neochen are native to South America, including species such as the Orinoco goose Neochen jubata and the upland goose Chloephaga picta. [FS01] Flannery, T., & P. Schouten. 2001. A Gap in Nature: Discovering the World's Extinct Animals. Text Publishing: Melbourne. [L86] Livezey, B. C. 1986. Phylogeny and historical biogeography of steamer-ducks (Anatidae: Tachyeres). Systematic Zoology 35 (4): 458–469. [S66] Sclater, P. L. 1866. Additional notes on the Anatidae of the genera Dendrocygna and Tadorna. Proceedings of the Zoological Society of London 1866: 148–150. [SC99] Sorenson, M. D., A. Cooper, E. E. Paxinos, T. W. Quinn, H. F. James, S. L. Olson & R. C. Fleischer. 1999. Relationships of the extinct moa-nalos, flightless Hawaiian waterfowl, based on ancient DNA. Proceedings of the Royal Society of London Series B—Biological Sciences 266: 2187–2193. [W04] Worthy, T. H. 2004. The Holocene fossil waterfowl fauna of Lake Poukawa, North Island, New Zealand. Tuhinga 15: 77–120.